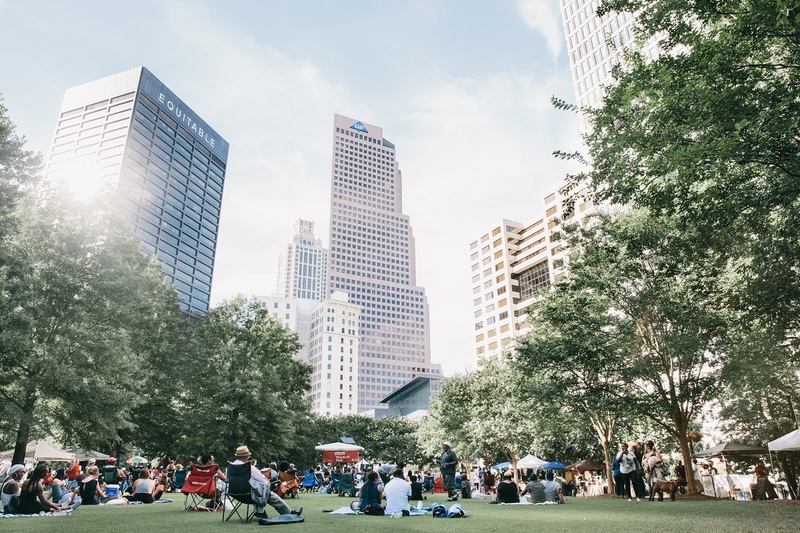 Nestled amongst the modern office towers and historic buildings of the Fairlie-Poplar district, Woodruff Park is a 6-acre park in the geographic center of Atlanta. Its location at the crossroads of commerce, government, and education makes it a natural gathering space for a diverse cross-section of Atlantans and visitors and a key starting point for exploring Downtown Atlanta and its surrounding neighborhoods. Originally known as Central City Park in the 1970s, Woodruff Park was created through a generous donation from Robert W. Woodruff, former president of The Coca-Cola Company. Today, through a Memorandum of Understanding with the City of Atlanta, the Atlanta Downtown Improvement District (ADID) maintains stewardship of Woodruff Park and is responsible for the park’s daily upkeep and programming, as well as securing and implementing funding for future development. The park offers visitors a variety of recreation stations and facilities scattered throughout its beautifully manicured six acres. In partnership with the Atlanta Police Department and Georgia State University Police force, Park Attendants patrol the grounds from 7:00 a.m. to 11:00 p.m. each day. Additionally, the Downtown Clean Team maintains a clean and vibrant park. A variety of park programming can be enjoyed by the general public. See a list of upcoming events here. Follow Woodruff Park on Facebook, Instagram, and Flickr for more info about events and happenings.